5/22/12. 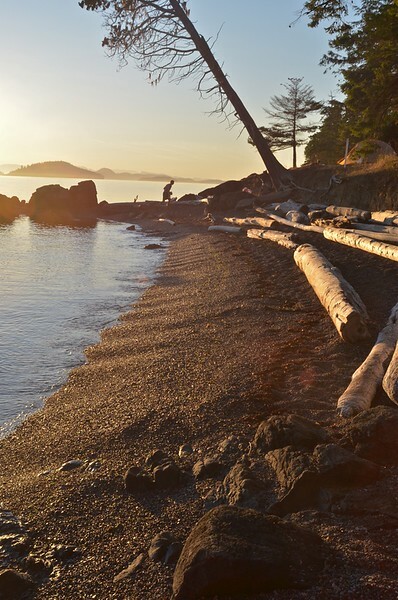 Continuing the coastal access theme, this is evening shot along the shore of Jones Island, a small state park in the San Juan Islands. You can reach the park only by boat and part of the island is dedicated to tent camping which is perfect for kayakers. One of the most beautiful and peaceful beaches I have visited - we slept directly on the beach and watched the stars sweep across the night sky.. Thank you for your supportive comments yesterday on the Arroyo Burro photo! I will gone for a few days attending to family business and will rejoin the dailies next week. Sorry I missed your shot yesterday, it's out of this world wonderful, so eery and very sic fi - ish. Lovely light & nice comp with the leaning tree & person off in the distance. See you next week! I like the back story to this peaceful morning light photograph sounds like a wonderful camping adventure!